Our Keynote Speaker for this year's Future of Law and Technology Forum 2017 is Professor Kenneth A. Grady. Professor Grady is Adjunct Professor at Michigan State University College of Law and a Member of the LegalRnD Faculty. Today the topic is Legal Consulting - Reimagining Legal Practices in the Modern World. It took a lot of pig fat to launch the titanic (seriously). If you take nothing else from the future of law, remember that. A LOT OF FAT. Ken feels that "from failure comes a learning experience". So, Ken poses the question - What can we learn from the Titanic and how we do law in the future? The Titanic had a very experienced captain - He made the kind of mistake that lawyers do too. We say "I'm very experienced and my experience tells me your case will turn out best if you do X". On thing the captain of the Titanic didn't do was pay attention to the data - There was information in relation to the ice bergs and ice flow. He ignored the data and preferred to rely on his own experience. There was nothing wrong with the bulk heads per se. But they were designed at an early stage of the process, and the design change. as a result, they were too small, and they were useless. The problem was that it was a Siloed activity - They were right, but not fit for the ship - The design changed and the design teams weren't talking to each other. There was enough of them, but many of them left with less than 1/3 of the people they could hold - The lifeboat solution met requirements but not the needs of the time. KEY POINT - For us as lawyers, it's time to stop rearranging deckchairs on the titanic. "For lawyers, data is the gateway drug to innovation". In Ken's view - We need to become hub of data in our practice - The tools the big companies use to analyse the data is available for us as lawyers. The data that the big companies have is the unique data for them. We, as law practices have unique data. We're not capturing the data that's unique to our practices. It's going to be central to how we make decisions if we capture it properly and start capturing enough of it. KEY POINT - The point here is that no lawyer could know that fact or outcome from experience or from looking at the cases. "If you're not gathering data you're wasting an asset". 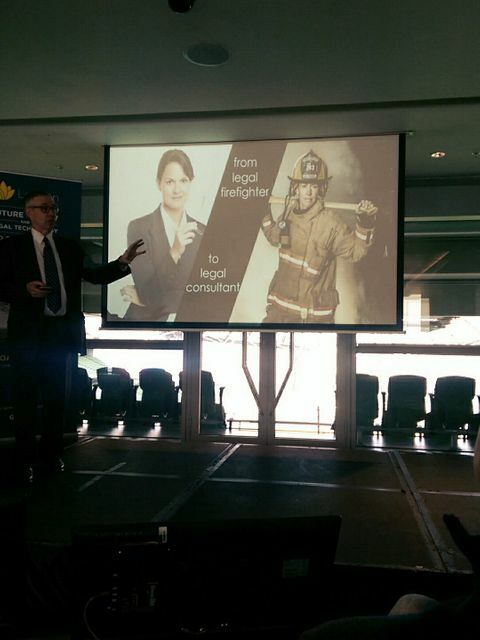 In Ken's view - "We need to go from legal firefighter to legal consultant". Somebody can embed code and help your client reduce risk. It sounds very sci-fi and far fetched, but it's not really once you get to grips with some of the terms and technologies. Design thinking - It's an add-on to a method of thinking Lean Thinking. Ken makes the point that he has never met a CEO of a company who said to him "We want to be equal to competitors"
Everybody wants an edge, they want an advantage - Lawyers, In House Counsel and everybody else want that. In House Counsel's favourite case will be the one that didn't happen. Competitive edge could be that we are cheaper - No Drag on the business. It could be that you have smart or simple contracts. Many ways you can have a competitive edge. Your prediction doesn't have to be perfect - You can get in the range, get in the zone and that's a start. Ken gave the example of a Toy Store they worked with - Litigious Society in the US. This company didn't want to have to deal with all the law suits. Wanted fewer law suits. That was the outcome the client wanted - Designed thinking solution to reduce it. Ken and his team looked at it and started from the data - That was the known element that they had. The data - What does it tell us? What can we apply to the data to use it with how we work? Looking at and analysing the data, they started probing how the toy company did things. With that knowledge gained, the team became proactive. The reimagined law practice goes beyond meeting existing standards - It gives the client a competitive edge.